The following is the first of a three-part blog series on Dynamic Content Management through IWCO Direct 1to1. Parts two and three will follow on Wednesday, November 14, and Friday, November 16. Earlier this year, I wrote that marketers’ urgent need to send data-driven, highly personalized offers presented us with a challenge: to find and implement a configurable technology platform that provides a user-friendly workflow that automates the management of variable offers, text, and images. IWCO Direct’s answer to this challenge is IWCO Direct 1to1℠. As adoption of IWCO Direct 1to1 caught fire, we recognized marketers’ thirst for information about how to identify and implement a proven technology solution, using advanced capabilities powered by AI and other tools, to improve the selection of targeted messaging, change management and quality control. It goes without saying (but I’ll say it anyway) that the platform must do this while also delivering marketing communications across multiple channels with accuracy and timeliness. 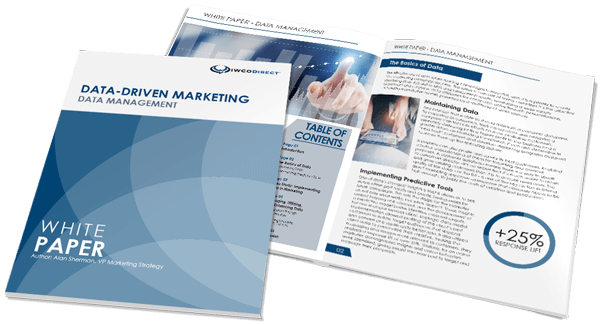 To help quench that thirst for knowledge, we developed a soon-to-be published white paper titled Solution for 1-to-1 Marketing. To help build excitement about its availability, we’re dedicating this week’s SpeakingDIRECT posts to excerpts from the white paper with case studies to show how clients implementing IWCO Direct 1to1 have reduced cycle time and resource needs by reusing and sharing content. This enhanced collaboration and ability to apply selective content changes within hours (vs. what used to be days) offers real-time validation and reduction in errors through automated processes. Our forthcoming dynamic content management white paper covers personalization, omnichannel delivery methods, data security, and industry-specific benefits. We know these subjects are top-of-mind for our clients as they look to increase speed-to-market and ensure compliance in a time when safeguarding data is paramount and there are increasingly stringent privacy regulations (like GDPR and California’s Consumer Privacy Act) that must be followed. Stop back tomorrow and again on Friday to get a taste for how to automate proofing, layout variations, version management, and targeting with a single workflow that enables delivery to multiple channels. We’ll also share some exciting news about the expanded capabilities platform we offer today to simplify the creation and management of automated personalized communications for customer acquisition and retention. I hope you’re already hungry to learn more—I promise to provide a palate-pleasing array of information.